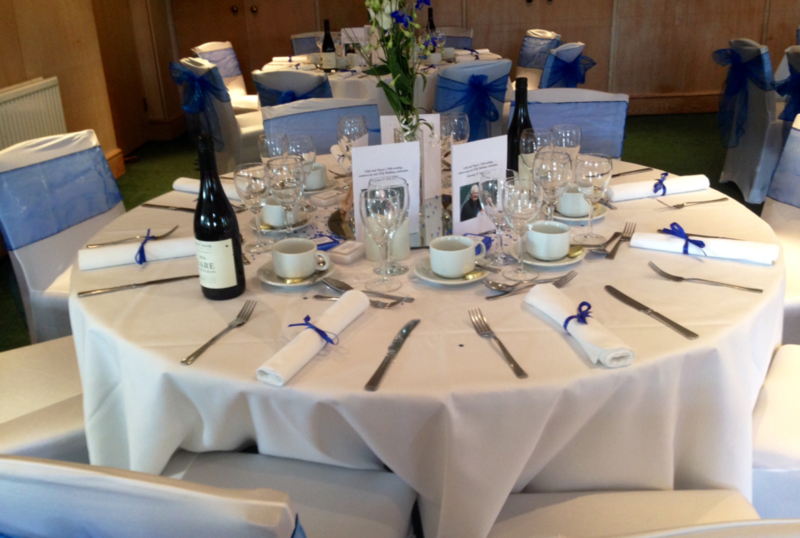 Bar and Catering :: Mature downland course, with its rolling fairways, and stunning views over the horizon of London. The most attractive feature of the dining experience is the ambience and position of the restaurant, lounge, terrace and ballroom areas, all of which enjoy an elevated position overlooking the 1st Hole a par three that falls away from the clubhouse. The rolling fairways of the 10th and 18th holes that rise amongst a symphony of trees into the distance, are clearly visible. The overall effect is one of peace, tranquillity and well being away from the pressures of modern life. Our bar staff and dining staff are well known for their friendly and efficient service and provide that extra ingredient that ensures the success of any occasion or celebration. Seating a maximum capacity of 64 guests, the restaurant can be set up for any combination of requirements, from candlelit restaurant nights to formal club dinners, all can be accommodated. Our catering services are provided by in-house staff and in addition to providing for the full range of golf club bar snacks, lunches and dinners, the service proposition covers the co-ordination and planning of special events e.g. weddings, parties and any kind of special celebration. Attention to detail is a key element of our customer service proposition. Local suppliers are used for all our ingredients and produce so that members, guests and visitors can be provided with the best quality and freshest food available. Please contact: Bar & Catering Manager on : 020 8657 1231 for enquiries about bookings and available menus. The bar serves members and visitors in both the traditional ‘19th’ golfers bar and the lounge adjacent to the restaurant. There is an extensive range of beerson offer including traditional ales and an extensive wine list. Weddings, special celebrations and private dinner parties are easily catered for with a bespoke design and planning capability provided by our in -house catering team. The restaurant, lounge, terrace, ballroom and bar area being directly linked offer flexibility in the use of space to cater for a wide variety of customer needs in both style and size. Societies have full use of the restaurant, lounge, terrace and ballroom areas to match their particular needs. The club is well used to catering for over 100 people.